ERA, a division of Tyman plc, is consolidating its three Midlands based operations at the major regional business hub, developed by an award-winning partnership of Staffordshire County, City of Wolverhampton and South Staffordshire councils. Company CEO Darren Waters said the move will help to transform ERA into Britain’s leading home security business and employer of choice within the sector and beyond. The move will see the company relocate from its current sites in Coventry, Willenhall and Wolverhampton to its new base at i54 South Staffordshire. The new purpose built 135,000 sq ft facility will include design, prototyping, testing, manufacturing, assembly, warehousing and a customer training centre. ERA has a rich heritage in the industry and can trace its roots back to 1838 and its founder, John Reynolds, who started a locksmith business down Fletcher’s Lane in Willenhall. More recently it was the first company to manufacture the five-lever mortice lock – the benchmark for the UK insurance sector. Now it has its sights set firmly on the future with its development of integrated smart security solutions. 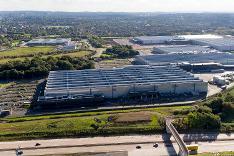 Darren said: “i54 is an outstanding business location with excellent transport links. It’s a great fit with our long term business strategy and will help to differentiate our brand, both as a supplier and employer”. ERA will join ISP, Moog, Eurofins and Jaguar Land Rover at i54 South Staffordshire, which has its own dedicated motorway junction which was built by the council partnership as part of the whole site development. Bulleys Chartered Surveyors acted on behalf of the partnership in the transaction.